About the Author: Fred Wilharm earned a B.A. degree in Broadcast Communications in 1980. He has been a video hobbyist as long as there has been prosumer equipment, owning and using the first camera/VCR combinations and their replacements, right up to the current crop of DV cams. He directed the television ministry of a Southern Baptist church in the Fla. Panhandle for two years, using the type of equipment described here. He has recently sold his unrelated business of 15 years and started Mainstreet Productions, producing small town historical videos, Christian movies, music videos, etc. Live switching can make your job as a videographer easier in many instances. It lets you cover an event, such as a church service, wedding, football game, etc. with multiple camera angles, effectively doing away with the need for later editing (if done right). With the recent introduction of consumer and prosumer level mixers, low cost/high resolution cameras and other affordable equipment, live switching has become a viable alternative that was not possible just a few short years ago. 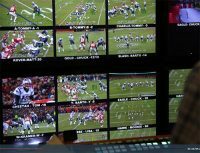 This sudden access to the masses of broadcast quality equipment will revolutionize TV as we know it today! There are plenty of reasons for the “Financially Impaired” to use Prosumer rather than broadcast equipment. First, but not least, is cost – a suitable 3 chip camera can cost 1/2 to 1/3 as much as its professional counterpart. Second, Prosumer equipment does not require the unending amount of expensive peripheral equipment – TBCs, vectorscopes, transcoders, etc. And finally, Prosumer equipment is being used for broadcast television every day! For example, the series “Trauma, life in the ER” is shot with the Panasonic AG-EZ 1 camcorder! Videography Magazine has run articles nearly every month about the Canon XL1 or the Sony VX-1000 being used to shoot a documentary, capture an event where no large camera would work (such as in China) , or even shoot a feature film, with its output transferred to 35MM film! Still doubt that it will work for your local cable show? At one time, the only possibility was all cameras manned by an operator, or stationary, mounted on a tripod. Recent developments in low cost, remote controlled pan/tilt heads have made it possible for one operator to now control three or more cameras! Some situations, such as TV ministry, will require at least one camera be manned by an operator. But other shoots can be done entirely with remote cameras. The DCR-TRV900 is a new, more affordable 3 chip cam around $2200 that will reduce the cost of broadcast quality acquisition. Also, the new Sony GV-D300 digital (Walkman sized) VCR represents the first low cost way of recording top notch video, at only $1300. This camera and VCR are both mini DV so you will have to dub the DV footage over to your station’s format at the station. But your dub will look as good as if it were recorded live. Live switching systems can range from very low cost to very expensive, depending on your quality needs. To produce tapes suitable for dubbing onto VHS, a simple system with two one-chip camcorders, a low priced mixer and a Hi 8 or SVHS VCR is all you need. For better video quality, you need a Hi res camera capable of 500 horizontal lines of resolution. This high resolution is needed so that the final result, after dubbing and signal loss, will be as high quality as possible. Good examples of cams capable of this kind of resolution are the new Mini DV cams, available in single and three chip models. Single chip models are low in cost, while three chip models provide color accuracy and depth closer to broadcast TV cameras. Examples: Canon GL-1 ($2200 street), Sony TRV 900 ($2000 street). Both are highly recommended. This system, along with cables and monitors could be had for $15,000 to $20,000. While this sounds like a lot, it could do the job of a broadcast system from a few years back selling for well over $50,000. Add panheads, cables and a couple of 13″ monitors and you are still under $3000. There are other camcorders that would work – just make sure the CCD has at least 470,000 pixels and has an S video output. If you record in the VHS format, your dubs will suffer a significant drop in quality. Since these are one-chip cameras their color depth is not as good as three-chip cameras, but they do well in low lighting conditions. Why are we using camcorders when all we need are cameras? Because at present, there are no prosumer 3 chip cameras without recording sections. There are quite a few cameras in the professional lines that would fit the bill nicely, but since our objective here is highest quality at lowest cost, we will not consider the overpriced pro lines (my humble opinion). Perhaps the manufacturers will see the need for low cost 3 chip cameras and respond accordingly. This can be a non existent problem if you BUY THE SAME MAKE AND MODEL CAMCORDER. Matching different cameras can be a nightmare, especially between 1 chip and 3 chip models. The new Videonics MX-Pro mixer has provisions for color correction on each channel, a welcome improvement which can help match different cameras. And some of the better DV cams such as VX-1000 have color correction adjustments which can also help you match different cameras. An important part of color matching is “white balance”, an automatic or manual adjustment on all color cameras. Fortunately, the auto white balance circuitry in most cameras does a good job, making it seldom necessary to use the manual settings. White balance comes into play mainly when changing types of light sources (such as fluorescent, incandescent, sunlight, etc.) Proper white balance with three cameras is a little trickier than with one, but choosing the same model cam can help. In most cases you have two choices – fixed focus setting, based on a guess of how close your subject will usually be, and auto focus. Whether or not you can use auto focus depends on what objects will be in the foreground, (which could fool the auto focus) and how often. If you are shooting a stage 30 feet away, then simply focusing on the stage and leaving it will work. If you are shooting a moving subject that will vary between 10 and 20 feet from the camera, with little possibility of objects in the foreground, then auto focus (on a good camera) will work. The Sony VX-1000 is the minimum camera I would consider using auto focus on. Many previous models have a tendency to “hunt”, making them unsuitable for broadcast use. The VX-1000 also has the distinction of being the only prosumer cam that can be focused via wired remote control, an elusive beast called the RM-95. Once available as an accessory from Sony dealers, it is now only obtainable in a version designed for technical adjustments, but it still controls zoom and virtually every other camera function. According to a web source, you can order it from Sony (1-800-488-7669) by asking for “Jig, (Wired) Internal, model number J-6082-053B”. Cost is $78.28 plus $6.50 for shipping and any sales tax. Zooming your remote cameras can be accomplished via the infra red remote that comes with the camera. If the cam is only 10 feet or so from you, you can simply point the remote at the camera to zoom. If further away, use an infra red repeater (remote extender) to control your zoom anywhere in the room. This is discussed in detail under remote pan/tilt heads. The cable connecting your cameras to your mixer can make or break your system. This is no place to be cheap, yet, you can pay a fortune and only get average quality. The best rule of thumb to go by is that heavier is better. For instance, instead of using typical composite cables to connect your cameras (we’ll get to S video in a minute), you could purchase RG 59 cables at Radio Shack in pre-made lengths, then simply add adapters to convert the F connectors to male RCA connectors. Then you will be assured you have the best possible cable. This can also be done if you have S video capable cams, but you use one RG-59 cable to carry the luminance signal and one for the chrominance signal. Adapters are available to terminate the two cables into a single “S” connector. This is the hard way, the easy way is to simply buy the best S video cables possible. I’ve seen lots of debate on how far you can run an S cable without significant loss, my personal opinion is about 75 feet with a QUALITY cable. I use the Elitevideo Hypercables, they give excellent results (but are quite expensive, as most good things in life are). Elite also sells a “Long Distance Runner” device that lets you run up to 1200 feet on ordinary telephone wire. ***** NEWS FLASH – received the Long Distance Runner and did a quick test by connecting my DSS box to the encoder and my home TV (a 600 line Mitsubishi) to the decoder. Could see absolutely no degradation of the picture. I was running through 150 feet of extremely cheap solid conductor 24 gauge Radio Shack speaker wire. I believe the product performs as claimed, and while not cheap, will allow videographers to compete with the “big boys” with remote trucks. Live taping an event with several cams means you will no longer be using the camera mike (usually a poor way to grab sound anyway). The ideal way to tape your event is to connect your recording VCR line input directly to the PA system line output, preferably balanced XLR line, assuming a PA is being used. If done correctly, this can give you incredible sound! But lets say you are in a theatre, and the sound board is 200 feet away. Now what? Well, I’ve had success with placing a good mike (over $100) in front of the a speaker (makes sure it’s a house speaker and not a monitor – they carry different mixes). If neither of these is practical, a good shotgun mike ($200 and up) may solve the problem. Place it on a stand within 20 feet or so of the subject. This will usually do the job fine unless you’re in a large room with excessive echo. Recording good sound can make the difference between an amateur production and a pro one, it’s that simple. Once your switching system is put together, you must learn how to use it to get pro results. Let’s say you’re shooting a wedding with two remote cameras and one you operate. You station a cam discreetly in front of the church, able to shoot down the center aisle. Another is on the left side, and the third is in the balcony with you and the mixer/ VCR. (This situation is where you will need those long cables!). The two downstairs cams have remote panheads, you control the upstairs unit. The music has started and the bride is heading down the aisle. You start with a wide shot from the balcony, as she walks into the frame. Using your preview monitor, you position the left hand cam, which hopefully is shooting over the heads of the crowd which is now standing. Fade in to it, using a medium shot. As she is about to walk out of the frame, go to the front cam, which is already positioned on the front portion of the aisle. You’ll get a closeup shot of the glowing bride’s face that was simply not possible with the typical “one camera in the back” setup. Then fade back to a balcony shot, showing the whole wedding party in position. You get the idea – but how do you control the cams from a distance? Here’s how. These little jewels are the key to a successful unmanned shoot. Two models are made (you may find the same units with different names). The first is made by Bescor. It can handle any camcorder up to XL-1 size, and is extremely SMOOTH in operation. Combined with the image stabilization in most cams these days, the Bescor setup can fool anyone but an experienced video guy into thinking the cam is manned. The Bescor is wired, which can be a liablity at times. It does have the option of adding extension cables, each 20 feet long. It has a flat disc control that lets you pan and tilt at the same time, a great feature. It sells typically for around $100 (considerably more if you don’t shop around). If running wires is not a problem, I highly recommend it. Another unit is made by Sunpak. It is wireless, a big advantage. It is controlled by infra red remote, which means you can normally only control it “line of sight”. What I have done, to operate a cam 75 feet away, is to use a “remote extender”, a device intended to let you control your TV from other rooms in the house, available at Radio Shack and elsewhere. The Sunpak has the added advantage that its remote can be programmed to operate the zoom on Sony and some Canon cams. Simply point your remote at the extender, and pan, tilt or zoom your camera as far away as 100 feet! Unfortunately, the Sunpak unit is not very tight, tilting up and down will result in some jerkiness, so I don’t recommend moving the camera often while “on the air” on the Sunpak. It sells for about $30 more than the Bescor. Using either of these units effectively requires lots of practice, just like any other camerawork. Do a non critical project with your system before attempting a “once in a lifetime” wedding or other event. I suggest a Canopus DV Raptor or other DV card with a TRACK RECORD, on the market for at least a year so that the bugs have been worked out. Rather than trying to use an existing computer, dedicate a new system to video editing. Save yourself some trouble. Now, have your computer dealer build the system with all the above parts, and let his tech deal with getting it to work. You’ve now eliminated the worst part of the NLE deal, tweaking and fiddling till it works. By the way, I sat and watched my tech accomplish this in about 20 minutes. And, future problems with the system may now be under warranty! If for some reason he can’t get part of the system to work, it’s his problem ( another reason to try and buy all parts from him if possible). You could also try Electronic Mailbox, at Videoguys.com. They have excellent support. Have him use the Fastrack controller to control the two drives, using the “Raid Stripe 0” parameter. You now have 40-54 gigs of storage, with the ability to add another 54 or more.IDE drives are ultra fast under Fastrack, double the speed as opposed to without, so no dropped frames occur. The total system should run $3000 to $4000, depending on how well you shop. Do not “cheap out” and get a non PIII chip as results will be somewhat riskier. Athalon chips, while screaming fast, are unproven for DTE so far. Let me know what you think. Send Fred mail. Thanx for sharing this info. Muchly appreciated!